Nearly 15 years ago, Google launched Gmail as an invite-only beta email service. Little did we know Gmail would forever change the email landscape. Released on April 1, 2004, Gmail was met with skepticism, as Google was known to relish in a prank or two on April Fools Day, but the free email service was no joke. Today, Gmail is Google’s flagship email product. Based on domain tracking results from 250ok’s Seedlist Optimizer, Gmail accounts for more than 35 percent of our clients’ B2C list distribution this year, up from 33 percent in 2018. For B2B senders, Google Apps comprised nearly 30 percent of the B2B list, up more than 6 percentage points year-over-year. This past year, we witnessed Gmail evolve with a flurry of new features and functionality, a fresh redesign, increased security, email annotations, and surpassing 1.5 billion users worldwide. What’s in store for Gmail? If history is any indication, Google loves to celebrate anniversaries with new features and announcements, and I think Gmail’s 15th birthday may include the following gifts. 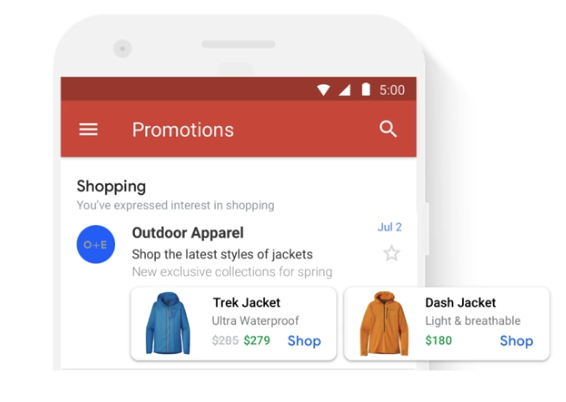 Last December, Google’s email annotations were released, allowing marketers to “include images, deals, expiration dates, and other offers to help bring promotional emails to life.” Designed to deliver more value for marketing email in the Gmail promotions tab, email annotations functionality is only available on the Gmail mobile app for iOS and Android. Email annotations created a lot of buzz in the email marketing community, and I think Google will announce the addition of desktop support. This news will infuse more energy for marketers to start annotating their promotional emails, testing and previewing (we have a free tool anyone can use to do just that), and capitalizing on their subscribers using Gmail, the most popular webmail client in the world. Along with the addition of desktop support, I believe email annotations will expand to include other bundles and new features such as catalog cards with calls-to-action for events, merchandise, and other topics. These features will open up innovative ways for marketers to inspire and drive action from consumers without ever having to open an email. Jordan Grossman, Product Manager at Gmail hinted at these additional features back in 2018. Have you ever needed to draft an email, but not send it immediately? Based on evidence from a breakdown of code in the latest version of Gmail for Android, Gmail app users may soon be able to schedule emails in advance. Recent reports show Google is embedding code related to allowing users to compose an email and send it at a specified future time ranging from two minutes to 50 years from now. Google is all about improving efficiency, and this new feature fits their M.O. 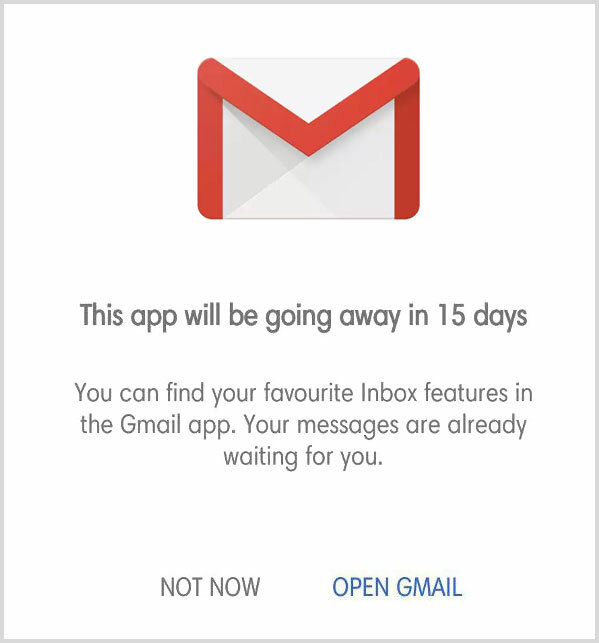 Google announced in September 2018 that it would be deactivating the Inbox by Gmail app toward the end of March 2019, and a recent notice from Google to Inbox users confirms it will end service to the app on April 2. Inbox by Gmail was an experimental email app launched in 2014, offering users features like snoozing emails, bundles, smart reply, and high-priority notifications, many of which made their way to the recently redesigned Gmail. I’m excited to see what, if anything, Gmail has in store to celebrate their milestone birthday. Now if you’ll excuse me, their birthday cake smells just about done.